The party chief and former UP CM is set to address a rally Friday in Sidhi — the pocket borough of late Congress leader Arjun Singh. New Delhi: While new Madhya Pradesh Congress president Kamal Nath is planning to align with the Bahujan Samaj Party for the assembly polls later this year, he might have to contend with another big force from neighbouring Uttar Pradesh — the Samajwadi Party. SP president and former UP chief minister Akhilesh Yadav is all set to start his Madhya Pradesh campaign with a rally in Sidhi Friday. Sidhi is the pocket borough of late Congress leader Arjun Singh; currently, his son Ajay Singh is the MLA from Churhut assembly seat in the region. 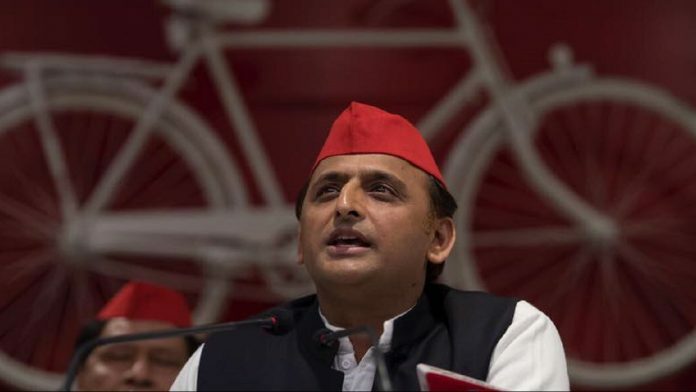 This will be the party’s third attempt at expanding its footprint outside Uttar Pradesh since Akhilesh became its national president, after trying its luck in Gujarat and Karnataka. Akhilesh had campaigned in Gujarat last year, but skipped the run-up to the Karnataka polls. The SP, formed in 1992, first contested assembly polls in MP in 1998, and won four seats. Then, in 2003, it won seven seats and accounted for almost 9 per cent of the total votes polled. However, in 2008, there was a sharp decline in its fortunes. The party won only one seat and its vote share dropped to around 2 per cent. It didn’t contest the 2013 polls. But this time, the party seems quite serious about Madhya Pradesh, which is why it has started its preparations well in advance. The plan, currently, is to contest all 230 seats, though the SP’s main focus will be on around 25 seats in the areas adjoining UP, where it has its main support base. “Akhilesh ji will address a rally in Sidhi on 18 May and then hold a press conference in Khajuraho the next day,” said Rambriksh Singh Yadav, SP leader in charge of the rally. There’s speculation that the SP’s rally is a pressure tactic to force the Congress into forging an alliance. But Rambriksh denied this, saying the rally was just part of the SP’s own growing ambitions. “Every party has the right to expand, and we are doing it since at one point of time, we were strong enough in the state,” he said.